Richard O'Kelly has returned to Walsall as assistant to manager Dean Smith following a short spell in charge of relegated Hereford United. After leaving Doncaster Rovers last September, the 55-year-old former Saddlers striker spent four months on Smith's backroom staff at Bescot last season before taking the Hereford job. O'Kelly chose Walsall after turning down League One rivals Crawley. "There were a number of applicants but he's the man I wanted," said Smith. 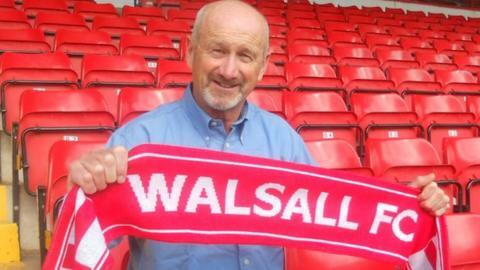 "I'm delighted to have secured my first choice and I'm delighted that Richard sees Walsall as his first choice. "He's a real football man with passion and enthusiasm. He is an excellent coach and he'll be a valuable asset here." During his playing career, O'Kelly scored 56 goals in 204 league games for Walsall after signing from non-league Alvechurch in 1979. He then moved to Port Vale in 1986, returning to Fellows Park to feature in the latter part of Walsall's 1987-88 promotion campaign under Tommy Coakley. But, after moving on to Grimsby Town the following season, his career was ended by injury. He returned to Vale as community officer before becoming youth team coach under old Saddlers team-mate Alan Buckley, first at Grimsby and then West Brom, where he spent seven years. After becoming assistant manager to Graham Turner at Hereford in 2002, he then linked up with Sean O'Driscoll, first at AFC Bournemouth and then at Doncaster Rovers. Following O'Driscoll's sacking by Doncaster last September, Smith invited him back to Walsall in November. O'Kelly then opted to take the offer of the Hereford job, just failing to keep the Bulls in the league on the final day of the season. Although he was offered an extended contract at Edgar Street, he turned that down - and the chance to link up again with O'Driscoll at Crawley. "It feels good to be back," said O'Kelly. "I'll be looking to build on what we did last year. "There are a lot of good people involved at this club who are striving to do the best they possibly can and I'm delighted to be part of it again."